Living in Orange County, I've come to accept its dearth of Malaysian, Singaporean or Indonesian restaurants just as I've accepted that O.C. real estate prices are insane. Yes, it's yet another one of those annoying constants in life, like taxes and movies by the Wayans brothers; if I ever wanted to eat at a Malaysian, Singaporean, or Indonesian restaurant, I'll have to trudge out in traffic to L.A. County to get it. Sure. Orange County's got Little Saigon, where a freighter's worth of cattle is tranformed into pho stock every day to feed the largest Vietnamese population outside of Saigon. And Thai food? 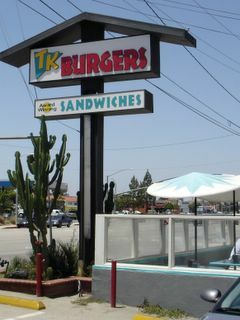 It's everywhere in O.C. Even Irvine's got three joints hocking pad thai at my last count. But you'd better gas up if you ever get a hankering for nasi lemak, or soto ayam. The Southies of Southeast Asia are better represented at the Rose Parade than they are in Orange County. Barely open for a month and a new neighbor for Zov's Bistro, Tropika in Tustin arrives to scratch the itch that people like me have been itching to scratch for years. 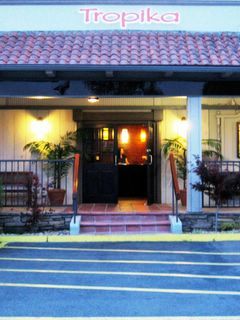 It bills itself as a restaurant serving "Malaysian and Thai Cuisine" -- with the "Thai" part slapped on as insurance in case the typical Orange County dweller is too quick to ask: "What's Malaysian food?" "Thai" provides a point of reference, you see -- somewhere familiar for us all to start from. And indeed, Pad Thai is available on the menu, but why on earth would you want that if you could've just gone to your corner Thai mom-and-pop? 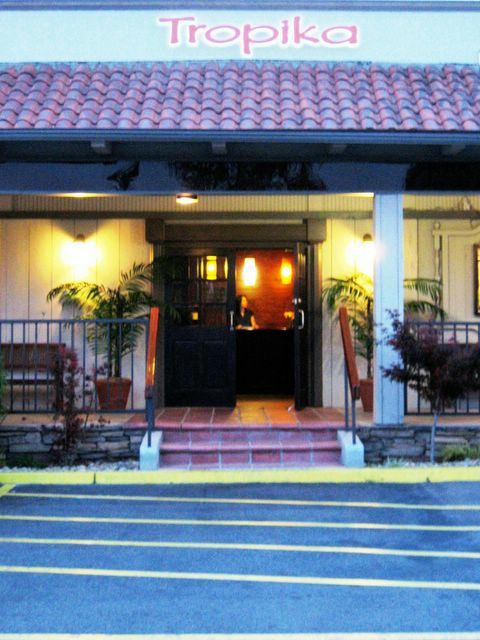 Tropika serves Malaysian food in Orange County -- revel in it! 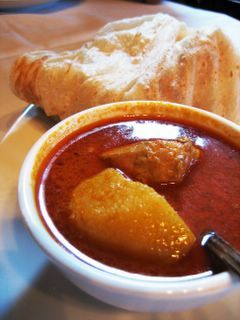 We began with the starter of starters for any Malaysian meal; Roti Prata ($3.25), also known as roti canai. This dish was at every single table that night. At first glance, you'd think this simple flatbread was a crumpled-up dinner napkin, mottled with brown spots. But everyone who ordered it seemed to know better. Upon its arrival and without hesitation, my dining companions and I tore off large ragged sheets from this doughy membrane, ripping it apart like ravenous raptors, stopping only for a dunk in the bowl of red curry, made with chicken and potato. Although roti hails from India, it is now as much a staple to the Malaysian table as it is to the cuisine of their Hindu neighbors to the northwest. Similar to naan, but stretched impossibly thin, the texture of roti is flour tortilla meets phyllo dough -- crisp and crackly at its periphery, paper-thin and chewy throughout. We used it to scoop up the thick, redolent flavors of the curry. 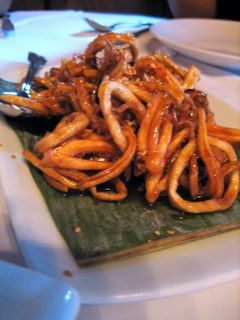 Another starter, called Honey Squid ( $7.95) was rigid and crunchy, not unlike Funyuns. The rings of the "baby squid" (their words, not mine) were interspersed among a few pieces of tentacle, deep fried and petrified in a state of suspended bliss. The sticky glaze of spicy honey gave the dish a sparkling and crystally sheen, like the crust of a Honeybaked Ham. 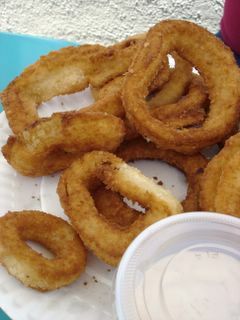 The mild heat and candy sweetness of the sauce balanced the fishy flavor of the calamari. 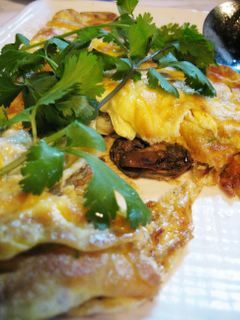 The Baby Oyster Omelette ($7.95) was simply prepared. Although by now I was wondering about Tropika's fascination for pre-pubescent sea creatures, this dish was just as advertised -- dark morsels of oyster (yes, little baby ones), were cooked with beaten egg and garnished with cilantro sprigs. You'll see this dish at Thai restaurants too, but never at IHOP. For Malaysian Seafood Hor Fun ($8.95), flat rice noodles were stir fried and sluiced with a velvety gravy made with cornstarch and egg whites. Entwined in the noodle ribbons were shrimp, squid, scallop, and crisp baby bok choy. Slurping was unavoidable, since the slippery noodles would escape our grasp if we had been more timid. 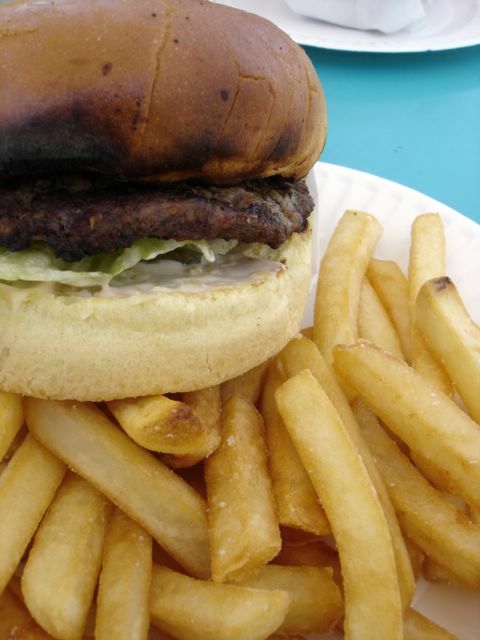 The flavors here were subtle and nuanced, a primer for the boldness of the dishes to come. The most expensive and spice-ladened dish of the night was a concoction called Rendang Beef ($12.95) -- a dish that is also held with high esteem in the Indonesian kitchen. Cubes of beef are braised in a brew of coconut milk, shallots, garlic, ginger, turmeric, coriander, and lemongrass. The pot simmers until the beef falls apart tender and the sauce is reduced into a brown paste which sticks to the meat like ants on a lollipop. Tropika's rendition was good, with the spices as sharp as a hot blade. 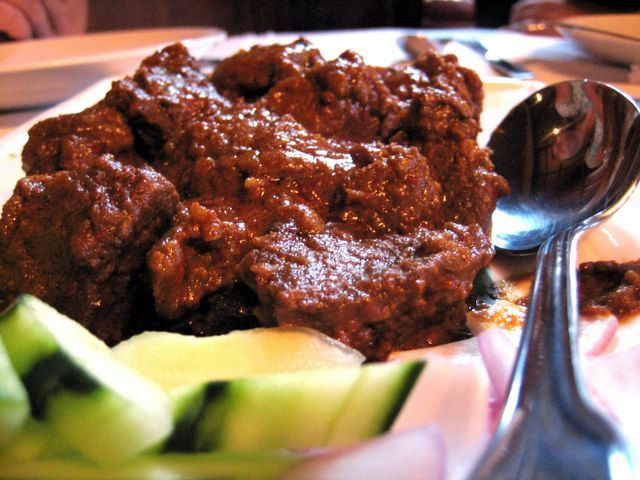 But Malaysian rendang has always been a bit too harsh for my born-in-Indonesia tongue. I prefer the Indonesian version, which is much sweeter and mellower. Malaysians will undoubtedly call me out on this, and I concede that O.C. beggars for Malay/Indo food can't be choosers. Regardless of my preference, we ate ours that night with satisfaction and gusto, accompanied by plenty of steamed white rice. 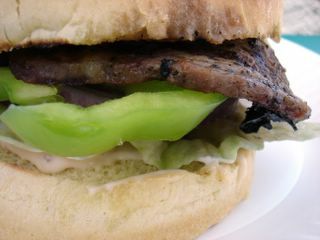 Alternating bites of cucumber and wedges of raw red onion refreshed our palates. 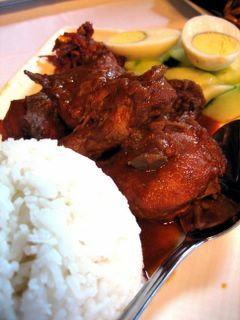 The best dish of the night (the reason I seeked out Tropika in the first place) was the Nasi Lemak ($7.95). Nasi, is "rice" in both the Malaysian and Indonesian languages. Nasi lemak is the Malaysian name for rice cooked with coconut milk. Indonesians call their rendition, nasi gurih. Although I can't attest to the meaning of the word lemak, I can tell you that in Indonesian, the word gurih means "savory". And this rice was quite savory indeed. In fact, I could've eaten it plain, since it was perfumed with the aromatic scent of coconut and was richly infused with its flavor. Tropika served the rice with four accompaniments, each worthy of being on the same plate with the nasi lemak. Its first mate was white meat chicken chunks, deep fried, served on the bone, and steeped in spicy red curry. The rest of the crew was led by fried anchovies and peanuts, rolling in sambal, which is chili paste made with the funky whispers of belacan (dried shrimp paste). Boiled egg and cool cucumbers flanked the rear, completing this perfect meal. Yes, O.C. 's finally got a new Malaysian restaurant, complete with white linen and a full bar. Eat your hearts out L.A., while we eat out our stomachs. Now if only someone can do something about those O.C. home prices. The folks at Nice Time Deli must not be happy. Right across from them, literally not more than twenty feet away, a new competitor has sprung up. And not just any challenger. 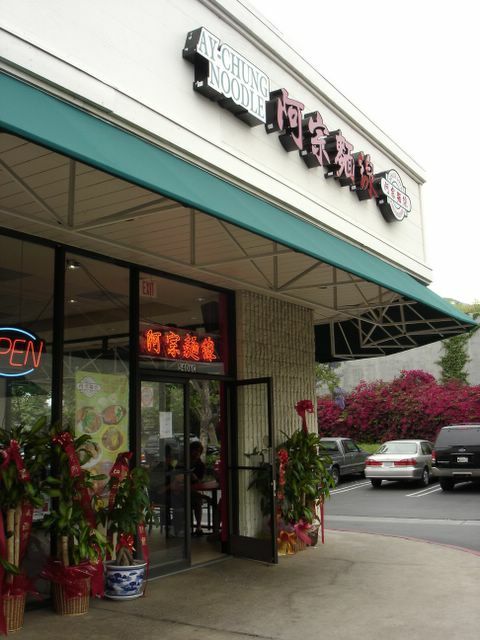 It's Ay-Chung Noodle, which carries with it the name recognition of a popular Taiwanese chain that already has stores in Rowland Heights, Milpitas, and elsewhere. This new Irvine outpost takes over the space vacated by the failed Bin Bin Konjac -- a store hocking icy slush topped with gelatin -- which was not more than a few years old when it folded. Only time will tell whether the Irvine Ay-Chung will have better luck. But if the crowd I encountered there last Saturday evening was any indicator, Nice Time Deli is right to be worried. Wait time for a table was thirty minutes on average -- amazing when you realize that restaurant operates on the Carl's Jr. model. On this night, the busiest I've seen it since the grand opening a few weeks ago, numbered tickets were given out to those waiting to dine in, which included yours truly. When my number was finally called, I was assigned another number. This time it was the numerical I.D. of my table, which was being bussed by some very short Latinas in Ay-Chung baseball caps. Next, I stood in a line which snaked its way to the cashier. Once I found myself at the head of the queue, I placed my order, proclaimed the preassigned table number where I'd be sitting, and then paid for the meal -- in cash, of course. Afterwards, I elbowed my way through the wall of people still standing in line to order, to my table where my dining companions were waiting. It wasn't long before the food came out in rapid succession. 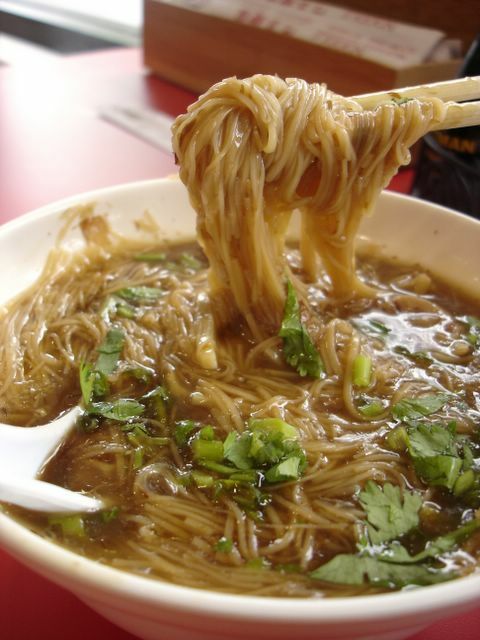 The quickest to arrive -- and the restaurant's most popular dish -- was the House Special Thin Noodle ($3.50); a bowl of wheat-based noodles, its strands as fine as angel hair, suspended in a murky brown soup as thick as gravy. Thickened with a healthy dose of cornstarch, this soup clung to the noodles -- almost to the point of making it slimy -- lending a sultry sheen to each slippery slurp. The powerful punch of pureed garlic, the sweet cinnamon whispers of star anise, and the boldness of bonito flakes inhabited every molecule of the soup, giving the noodles the reason to exist. The noodles, by contrast, were rough and sturdy; like denim to the soup's silk. 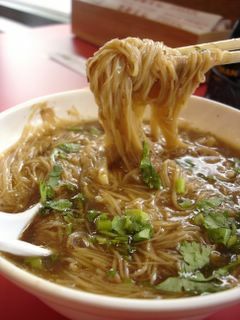 Added for texture were rubbery pieces of pork intestine, fibrous strips of bamboo shoots, and chopped cilantro. The intestines, which was also offered in a dish affectionately called "Chittering", succumbed easily to a few chews like tripe with a pork fat finish. The appetizer of Fried Crispy Squid ($4.25) came next. 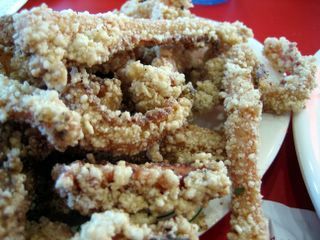 Caked with a light, bubbly, and crumbly batter, dusted with white pepper, salt and other spices, these strips of cuttlefish were finger food at its best -- something I can see being served as snacks at the night markets of Taipei. Unlike lesser incarnations of fried calamari, which can range from being overdone and rubbery to underdone and slimy, these hit that elusive sweet spot -- tender, greaseless, and meaty. 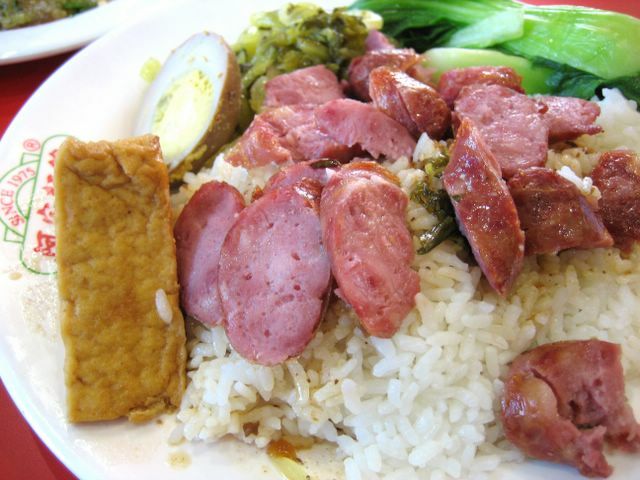 The Chinese Sausage Rice ($5.25) was substantial for the price. Shorn pieces of sweet lap cheung, soy-sauce boiled egg and tofu was served on a mound of steamed rice doused with the broth the tofu was cooked in. Steamed baby bok choy and Chinese pickled greens offset the protein and rounded out the meal. A Nice Time Deli favorite of mine is the uniquely Taiwanese delicacy usually called "oyster omelette". 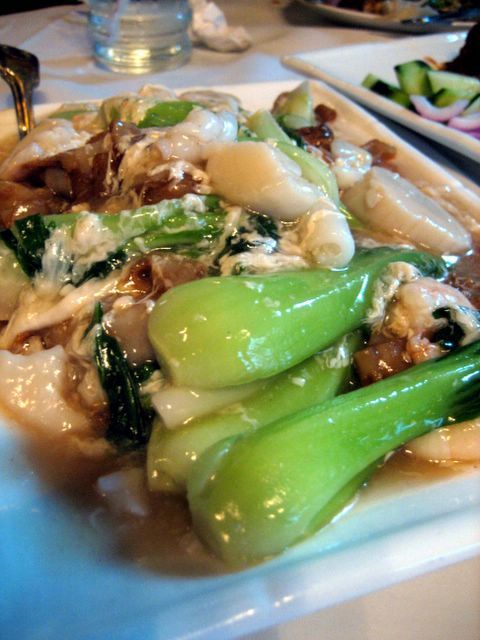 For the dish, oyster meat is cooked on an oiled pan with a thin layer of beaten egg and a glutinous rice flour batter. 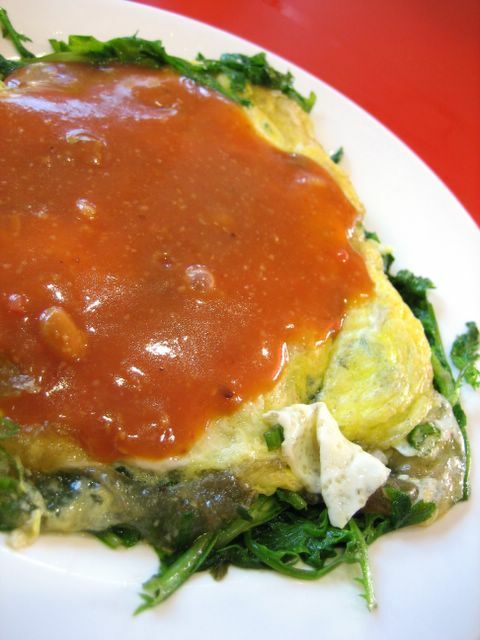 It's then served on top of sauteed greens and smothered with a ketchup-based sauce. It's a sticky, slimy, kooky appetizer one shan't find anywhere but a Taiwanese restaurant. Ay-Chung offers the dish but calls it Oyster Pancake. But I opted to try the Shrimp Pancake ($4.50), which operated on the same principles. Although all the components were present and accounted for, the shrimp was overcooked past the point of being edible; these crustaceans were so dry, in fact, they were almost dehydrated. However, I did find the wilted chrysanthemum leaves, which formed the base of the dish, to be peppery and perfect. The most ambitious dish we ordered was the House Special Steak ($7.95). 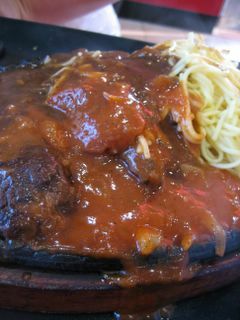 A thin slab of griddle-cooked beef was sluiced with a goopy tomato sauce, paired with spaghetti and a runny fried egg. It's served on a sizzling platter not unlike those used for restaurant fajitas. 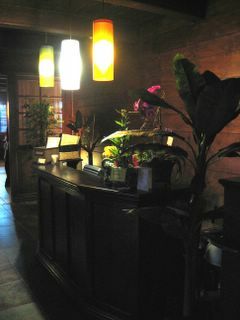 This one had us scratching our heads, and not just because they included a salad and corn chowder, both in soup bowls. The use of a sizzling plate just seemed out of place in a joint like Ay-Chung where water is self-serve out of a communal jug. Regardless of the oddity and the misplaced showmanship, the steak was gristly and chewy. The sauce which blanketed every square inch of it tasted like watered down Ragu pasta sauce, thickened to the point of absurdity with cornstarch. The folks at Nice Time Deli needn't worry about the last two dishes stealing away customers. But with 119 other items on their menu, Ay-Chung is still a force to be reckoned with. As the Chairman of Iron Chef would say "arr'h kizinn" ...let the Taiwanese Restaurant Battle begin!